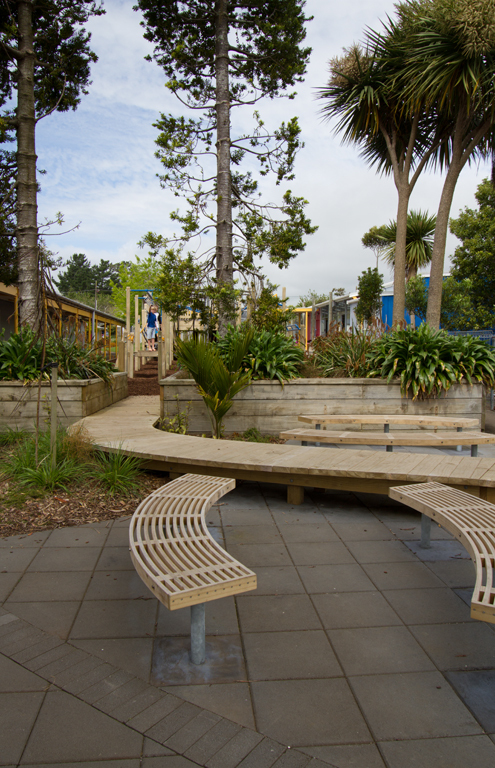 The brief was ultimately about transforming an existing unpleasant area into an enjoyable space for the children. Historically it had been a cold closed in area with a raised central planter and linear seating along the edges. The new space had to become an inviting area for a variety of activities and also a space that created interesting pathways connecting to existing buildings, gardens and play activities. References to the coastal nature of the school were also important with the inclusion of a variety of textures and natural materials. An exposed aggregate Koru with polished Paua inserts is a central feature of the space with intimate areas of curved seating tucking into its shape. 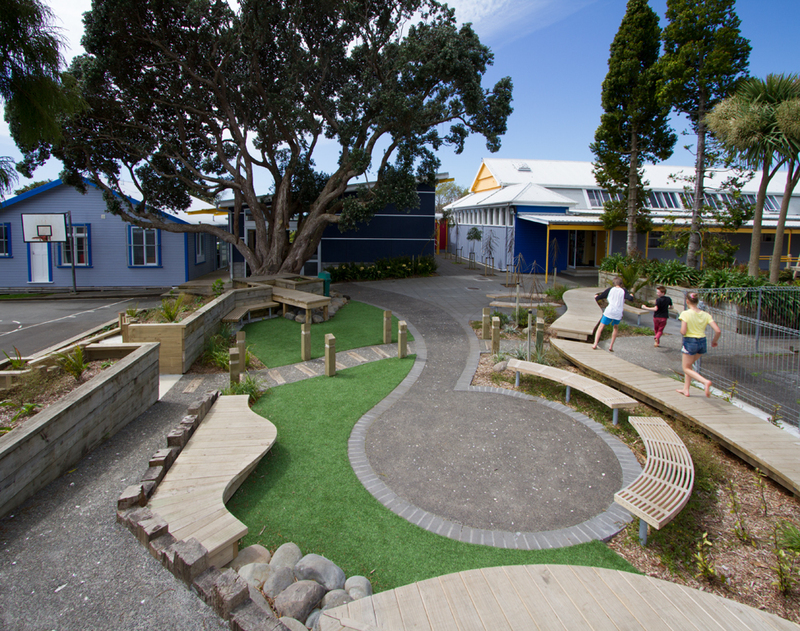 The Koru Landing – the official name for this area, forms a gathering space and a processional pathway to the Pohutukawa Centre. 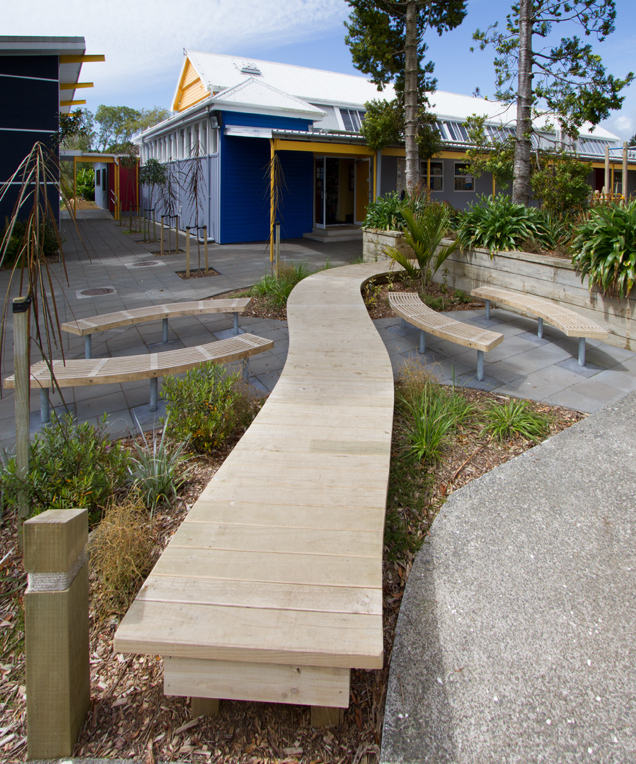 Other features – the raised timber boardwalk ; the two leaf platforms; the exposed aggregate ramp; the curved platforms ; the sleeper pathway and the jetty have become part of a circuit that connects to existing play structures and platforms and future play areas, and to the curved tiered riverstone seating area that faces out to the courts which has become a connected outdoor arena for classroom performances and learning. Since its completion this area has become a vibrant, interesting, connected and thoroughly enjoyed space by all.